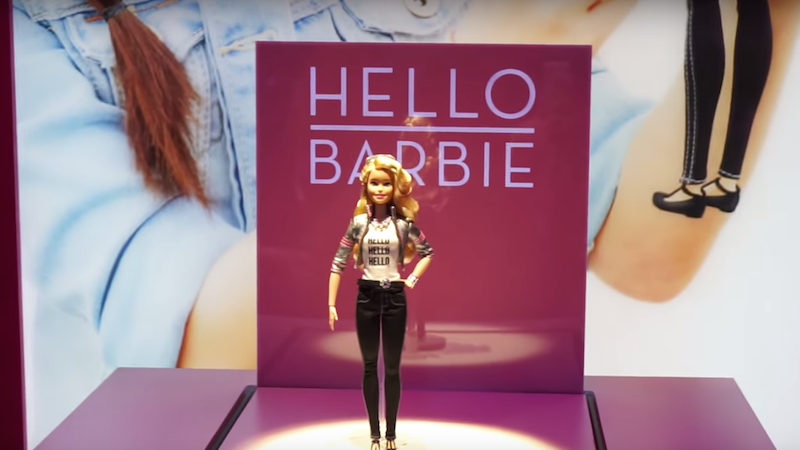 Kids will soon be able to hold real convos with Barbie instead of imaginary ones, with the introduction of the voice-recognition-equipped Hello Barbie. Welcome to M. Night Shyamalan’s next movie. Her necklace blinks and glows green (notifying the user that the Wi-Fi connection is strong) and the built-in microphone is set to pick up on conversations. She comes with her own personalized charging station; there are magnets in her feet so she can stand up in the charging portal, while her back gets plugged in for refueling. When someone says “Hi, Barbie. How are you?,” the doll “listens,” and that audio is transferred via the cloud to Mattel’s servers at its New York headquarters. A related piece of dialogue streams back to the doll and Barbie responds, “I’m good. How are you?” There are thousands of lines available in Barbie’s conversational repertoire, so chatting scenarios can play out in many ways. “I want to be a scientist,” I said, holding down the button on her belt which signals a user wants to communicate. “I love mixing things together,” I responded. “Wow, you sound to me like the next Marie Curie,” she said. This is way different than the time I was so excited to get my first movable Barbie with screws for joints. Also, much creepier. Parents have been, naturally, concerned about privacy. But according to Mattel, Barbie won’t ever request private information (name, address, etc.) from your kids, and parents will have the power to control which topics Barbie talks about. Nothing could possibly go wrong.